Toon's Tunes : California State Fair--begins this week! How quickly a year goes by... it's already time for the California State Fair! 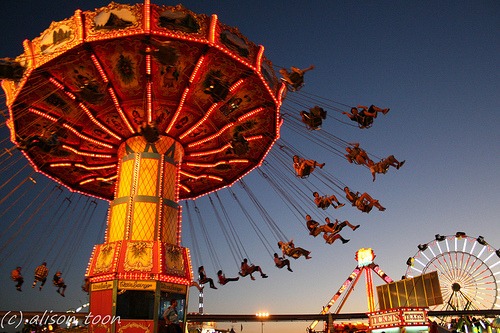 Rides, fun, music (17 nights of FREE concerts on the big stage, and on other stages around the fair), farm animals and gardening and crafts and art and bees and funnel cakes and everything-you-can-eat-on-a-stick. Especially: look out for A Mile Till Dawn, who will be performing on Monday 22nd at 7 p.m.
Full details on the BigFun website: http://www.bigfun.org. The fair opens on Friday 12th July, and runs until July 28th.